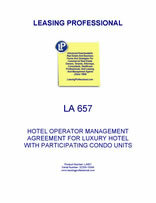 This hotel operator management agreement is for the management and operation of a luxury hotel developed in conjunction with adjacent residential condominiums. If the owners of the condominiums elect to participate the hotels rental program, their units will also be managed by the management company as provided in the agreement. The hotel operator is to be compensated by both a base fee and additional incentive compensation. The operator has well defined responsibilities under the agreement for financial reporting, and preparation of business plans for the property, as well as general management duties. Features The agreement contains extensive detailed definitions for the terms utilized in its provisions. The operator is responsible for preparation of an annual business plan for the property, and has extremely specific management duties defined in the agreement relating to appointment of the general manager and the other staff, implementation of appropriate labor policies, financial reporting and accounting, maintenance and repairs, service contracts for the property, food and beverage management, and advertising and public relations. HOTEL MANAGEMENT AGREEMENT (this “Agreement”) made and entered into this____ day of ________, 20__ by and between UPSCALE HOTEL OWNER, LLC, a ____________ limited liability company (hereinafter called the “Owner”), and HOSPITALITY MANAGEMENT GROUP, LLC, a limited liability company organized and existing under the laws of the State of ____________ (hereinafter called the “Operator”). “Adjustment Date” shall have the meaning set for the in Section 10.1 hereof. “Affiliate” of any person or entity shall mean any other person or entity controlling, controlled by or under common control with the person or entity in question. “Allocable Chain Expenses” for any period shall mean the Hotel’s pro rata share of all Chain Expenses incurred during such period. The Hotel’s pro rata share of Chain Expenses for any period shall bear the same ratio to the overall Chain Expenses for such period as the Gross Revenues of the Hotel bears to the aggregate gross revenues (calculated in a similar manner as the Gross Revenues of the Hotel) of all hotels opened to the public and operated or managed during such period by the Operator or its Affiliates and such Allocable Chain Expenses shall be included in Gross Operating Expenses; provided that Allocable Chain Expenses for any Calendar Year shall not exceed 3.0% of Gross Revenues for such Calendar Year. It is the intention of the parties with respect to Chain Services that the Operator and the Owner will not have to duplicate such service or cost at the property level, so the Owner will not incur a duplicate expense with respect thereto. “Annual Incentive Fee” shall have the meaning set forth in Section 10.2 hereof and be in the amounts as shown on Schedule 10.2 hereof. “Annual Profit and Loss Statement” shall mean a profit and loss statement prepared in accordance with, for so long as same shall be in effect and to the extent required by the Holder thereof, the applicable requirements of the Owner’s Loan Documents (and thereafter, the reasonable requirements of any loan documents evidencing or securing a loan held by a third-party unaffiliated lender that replaces the Existing Loan), and generally accepted accounting principles applicable to the operation of hotels and which is consistent with the Uniform System, applied on a consistent basis, and shall set forth the profit or loss of the operation of the Hotel for the prior Calendar Year. “Base Fee” shall have the meaning set forth in Section 10.1 hereof. “Benchmark Hotel” shall mean the _________ Hotel, located at __________________, or such other hotel, as agreed to from time to time by the Owner and the Operator as the Benchmark Hotel. In the event that any such hotel ceases to be managed or operated by the Operator or its Affiliate, or ceases to be managed or operated by the Operator or its Affiliate substantially in accordance with the standards in effect at the time at which it is agreed that such hotel is the Benchmark Hotel, such hotel as it was last operated by the Operator or Affiliate at the applicable standards shall continue to be the Benchmark Hotel or, unless and until the Owner and the Operator shall designate another hotel as the Benchmark Hotel. “Building” or “Improvements” shall mean the building or buildings on the Premises and all improvements, fixtures and appurtenances and all alterations, replacements, additions and substitutions therefor now or hereafter located thereon, including, without limitation, all apparatus, equipment or articles now or hereafter therein or thereon used to supply heating, gas, air conditioning, water, lighting, power, sanitation, laundry, refrigeration and ventilation, and kitchen, elevator, millwork (and other architectural finishes) and all other similar fixtures and equipment which are affixed thereto, exclusive of FF&E. “Business Plan” or “Budget” shall mean the annual budget and forecast of operations determined in accordance with Section 9.4 hereof (which shall include credit policies) as such budget and forecast may be modified from time to time in accordance herewith, and which budget and forecast shall be prepared in a form and manner consistent with the budgets and forecasts prepared by Operator or its Affiliate for the Benchmark Hotels. “Calendar Year” shall mean any consecutive twelve-month period commencing upon the first day of January and ending upon the last day of December during the Term (as hereinafter defined), except that the first Calendar Year shall be the period from the Commencement Date to the last day of December next following (provided that if such period would be a period of greater than 18 months, then the first Calendar Year shall be a pro-rated year from the Commencement Date to the last day of December next following) and the last Calendar Year shall be the period from the first day of January of the Calendar Year in which this Agreement terminates or expires to the date of such termination or expiration. “Cash Management Policies” shall mean those policies established by the Operator and the Owner with respect to the handling of Hotel funds; provided , that for so long as same shall be in effect and to the extent required by the Holder thereof, such policies shall be subject to the applicable requirements of the Owner’s Loan Documents, and thereafter, to the extent required by the holder thereof, to the reasonable requirements of any loan documents evidencing or securing a loan that replaces the Owner’s Loan. “Chain Expenses” for any period shall mean any and all costs and expenses incurred during such period by the Operator or by any of its Affiliates in respect of Chain Services. “Chain Services” shall mean those financial benefits, services and facilities provided by the Operator or its Affiliates (as opposed to third parties) in connection with the operation and for the benefit of the Hotel and the other _____________ Hotels, which are generally made available by the Operator in a non-discriminatory manner from time to time during the Term to _____________ Hotels. These essential benefits, services and facilities are typically those which would be performed at the property level but which the Operator can usually perform more effectively, efficiently and economically on a centralized basis because it provides such essential benefits, services and facilities to various hotels or because of some demonstrated expertise of the Operator. Chain Services presently consist of (i) convention, business and sales promotion services (including the maintenance and staffing of the Operator’s home office sales and public relations force), (ii) food and beverage (including promotions, restructuring of operations and non-day-to-day supervision, but subject to the terms of the Existing Leases), human resources, personnel and other operational departmental supervision and control services, (iii) certain home office personnel and staff who are directly involved in the operations of the Hotel from time to time but not otherwise physically located at the Hotel or on the Hotel payroll, (iv) audits (internal and external, financial and operational) and other accounting services, (v) graphic design services, (vi) supervision of purchasing and leasing, (vii) supervision of physical plant maintenance, (viii) special tenant and banking relationships, (ix) real estate tax audits and challenges, (x) Reservation System Services and (xi) labor negotiations. The Operator shall have the right to increase or decrease Chain Services for all _____________ Hotels from time to time in the Operator’s sole discretion; provided , however , that the Operator deems the increase or decrease in Chain Services, as applicable to the Hotel to be beneficial and economical for the operation of _____________ Hotels. “Condominium Association” shall mean the condominium association established under the Declaration. “Condominium Units” shall mean the individual condominium units created by the Declaration. “Condominium Unit Owner” shall mean the owner of a Unit as defined in the Declaration. “Commencement Date” shall mean the date hereof. “Competitive Hotels” shall mean those hotels agreed to by the Owner and Operator prior to the opening of the Hotel. In connection with the process for approving a Budget for each succeeding Calendar Year, either party may request review of and recommend revisions to the then-applicable list of Competitive Hotels and any revisions shall be subject to the mutual agreement of Owner and Operator. Any disagreement between the Owner and the Operator with respect to the hotels included in Competitive Hotels will be resolved by arbitration in the manner provided in Section 9.6 . In no event shall the list of Competitive Hotels contain fewer than five (5) hotels at any time. “Consumable Supplies” shall mean office, cleaning, engineering, laundry and valet supplies, food service supplies, decorations, menus, guest supplies (including stationery, soap, matches, toilet and facial tissues) and such other supplies as are customarily consumed on a daily basis in the operation of a hotel as required by the Hotel Standards. “Declaration” shall mean the declaration of condominium and all related documents including, without limitation, the prospectus and all exhibits and attachments thereto, and the articles and by-laws, pursuant to which the Premises is submitted to the condominium form of ownership all of which the Operator shall have the right to review and approve (provided, to the extent the same is reviewed and approved by _________ ____________ (“_________ ____________”), an affiliate of Operator, which entity holds an indirect interest in Owner, such approval shall constitute the deemed approval of Operator). “Existing Leases” shall mean those currently existing leases with respect to the Property, if any. “Existing Loan” shall mean that certain loan in the original maximum principal amount of $__________ from _________, _________ Branch, as administrative agent, and the participant banks from time to time party to the Owner’s Loan Documents, and Owner. “FF&E” shall mean all furniture, furnishings, fixtures and equipment, systems, apparatus, goods and other personal property used in, or held in storage for use in or required in connection with the operation of the Hotel and shall include Operating Equipment, specialized hotel equipment, guest room, corridor, restaurant, and lounge furnishings, office furniture and equipment, carpets, electrical appliances, kitchen appliances and apparatus, floor coverings, soft furnishings, artwork, decorative lighting, beverage and bar apparatus and appliances, telephones and telephone system, signs, television receivers and other electrical and electronic equipment, computer hardware and software, laundry apparatus and appliances, maintenance and engineering apparatus and appliances, function, banquet and conference furniture and apparatus, exterior and interior signage, office and back of house apparatus and appliances, motor vehicles and courtesy vehicles, and such other furnishings and equipment as are used in connection with the operation of hotels, and all alterations, substitutions, additions and replacements therefore; provided , however , that FF&E shall not include Working Capital. “FF&E Reserve” shall mean, following such time as the Owner and the Operator shall agree for the first time to include an FF&E Reserve in the Budget (any dispute as to the initial establishment of an FF&E Reserve to be determined by arbitration pursuant to Section 9.6 ), an FF&E reserve to be funded each Calendar Year thereafter out of Gross Revenues (or otherwise by Owner if required by any Holder) in an amount equal to four (4%) percent of Gross Revenues from room rentals as reduced by such amounts collected by the Condominium Association or the Hotel Unit Owner (for the upkeep of the Shared Facilities) under the Declaration. The amount of the FF&E Reserve, and payments into the FF&E Reserve, shall take into account assessments and other sums collected, or to be collected, from Condominium Unit Owners (whether paid to the Condominium Association, the Hotel Unit Owner or directly to the Operator or otherwise available from the Condominium Association) which may be used to pay for items otherwise to be pad for from funds in the FF&E Reserve. Provided that, to the extent that the Owner’s Loan Documents require an FF&E or similar reserve, and thereafter, to the extent that any loan documents evidencing or securing a loan that replaces the Owner’s Loan reasonably require such a reserve (provided that unless the Operator waives such requirement, any such replacement agreements shall not provide for more stringent funding ( i.e. , higher required reserve amounts or a requirement to fund the reserve irrespective of the availability of cash flow and/or prior to items which the Owner’s Loan Documents permit to be funded or paid before the FF&E Reserve) and disbursement requirements than the Owner’s Loan Documents), the “ FF&E Reserve ” shall mean such reserves required by the lender. The FF&E Reserve shall not cover FF&E within individual Participating Condominium Units. A separate account (the “Participating Units FF&E Reserve Account”) shall be funded by each owner of a Participating Condominium Unit in an amount up to four (4%) percent of the hotel room rentals generated by the owner’s Participating Condominium Unit (prior to any division of revenues between Condominium Unit Owner and the Hotel Unit Owner) as determined by the Hotel Unit Owner and the Operator and reflected in the Unit Rental Agreement (any dispute as to the establishment of an FF&E Reserve percentage from time to time shall be determined by arbitration pursuant to Section 9.6), and shall be utilized in connection with FF&E in the Participating Condominium Unit. A separate ledger account shall be maintained for each Participating Condominium Unit reflecting deposits to the Participating Units FF&E Reserve Account in respect of such Participating Condominium Unit as well as deductions therefrom in respect of such Participating Condominium Unit. In the event that the amount credited to the account of any Participating Condominium Unit is determined by Operator to be less than the amount necessary to maintain such Unit in accordance with Hotel Standards, Operator shall require an additional funding by such Participating Unit Owner in an amount sufficient to allow such Unit to be maintained in accordance with Hotel Standards and in the event that such additional amount is not funded within the time period as determined by the Operator of receipt of written demand, Operator shall advise such Participating Unit Owner that the Unit shall be suspended from participation in the Rental Program until such additional amount is funded. “Force Majeure” shall mean (a) strikes, labor lock-outs, other industrial disputes, accidents, inability to procure materials, governmental action or restriction, regulation or control, failure of power, water, fuel, electricity or other utilities, riots, insurrection, civil commotion, enemy or terrorist action, war, acts of God, fire or other casualty or (b) any other matter, cause or circumstances which is beyond the reasonable control of the Operator and/or the Owner and which materially and adversely affects the performance by the Operator and/or the Owner (as applicable) of the terms and provisions of this Agreement in each case to the extent the same has not arisen by reason of any breach by the Operator and/or the Owner or any other person for whom the Operator and/or the Owner (as the case may be) is responsible of any of the Operator’s and/or the Owner’s (as applicable) obligations under this Agreement. “Gross Operating Expenses” shall mean any and all costs, fees, charges, liabilities, obligations and expenses of managing, maintaining, repairing, marketing, promoting and operating the Hotel and administering the Rental Program (including distributions made to Participating Unit Owners) determined on an accrual basis, in accordance with generally accepted accounting principles and consistent with the Uniform System, including, without limitation, all salaries and employee expense and related taxes (including, without limitation, all wages, bonuses and other compensation of all employees of the Hotel and their social and fringe benefits which shall include, but not be limited to, life, medical and disability insurance and retirement benefits and other related employee costs), the cost of Consumable Supplies, utilities, insurance to be provided under the terms of this Agreement by the Operator (including without limitation the insurance described in Section 11.1(b) hereof) or by the Owner with the Operator’s approval, governmental fees and assessments, food, beverages, laundry service expense, license fees, advertising, marketing, reservation systems, and any and all other operating expenses as are reasonably necessary for the proper and efficient operation of the Hotel in accordance with the Hotel Standards incurred by the Operator in accordance with the provisions hereof (including, without limitation, (i) federal, state and municipal excise, gross receipts, cabaret, sales, use, personal property, real estate, employee withholding and all other taxes, levies or assessments paid over to federal, state or municipal governments by the Operator with respect to the Hotel, (ii) the Base Fee, (iii) Allocable Chain Expenses, (iv) deferred maintenance to the extent that same is not a capital expense; all determined on an accrual basis in accordance with generally accepted accounting principles and consistent with the Uniform System). Out-of-pocket expenses of the Operator incurred for the account of or in connection with the Hotel operations, including reasonable travel expenses of employees, officers and other representatives and consultants of the Operator permitted by Section 6.1 hereof shall be deemed to be part of Gross Operating Expenses and such persons shall be afforded reasonable accommodations, food, beverages, laundry, valet and other such services by and at the Hotel without charge to such persons or the Operator. Depreciation and amortization on the Hotel, and the establishment or replenishing of all reasonable reserves (including, without limitation, for FF&E, Working Capital and capital expenditures) at the Hotel, shall not be Gross Operating Expenses. “Gross Revenues” shall mean any and all revenues, profits, receipts and income of any kind determined derived directly or indirectly by the Operator from the Hotel (exclusive of any sums credited or payable to Owner that are duplicative of sums credited or payable to any Condominium Unit Owner other than the Owner) including, without limitation, rentals, reimbursements or other payments from tenants, hotel guests, lessees, licenses or concessionaires, on an accrual basis, paid or collected, determined in accordance with generally accepted accounting principles and consistent with the Uniform System including revenue from off-site catering, net vending machine revenues, the gross receipts of any Hotel Amenities and the fair trading value of reasonable barter transactions, and excluding, however: (i) funds furnished by the Owner (or Participating Unit Owners, including assessments imposed on them) and interest earned on the Owner’s funds, (ii) subject to the provisions of Articles 14 and 15, proceeds of insurance and condemnation other than business interruption insurance, (iii) gratuities to employees and sales and other taxes collected by the Operator, (iv) all loan proceeds from financings or refinancings of the Hotel or interest therein or components thereof, (v) judgments and awards, except any net proceeds thereof arising from normal business operations of the Hotel and paid in lieu of operating income, (vi) proceeds of a sale of condominium units or a sale of the Property, (vii) actual bad debts arising from Gross Revenues, provided that any recovered bad debts shall again become part of Gross Revenues in the Calendar Year in which they are recovered, (viii) complimentary rooms, food or beverage provided to employees by the Operator as required by this Agreement, (ix) proceeds of sales received or receivable at the Hotel for other hotel accommodations, goods and services unrelated to the operation of the Hotel or to be provided at other hotels, although arranged by the Operator, (x) revenues, including gains or losses arising from the sale or other disposition of capital assets, including FF&E no longer required for the operation of the Hotel, (xi) proceeds, or awards arising from a taking or condemnation of capital property other than an award for temporary use, (xii) receipts or credits for settlement of claims for loss or theft of or damage to personal property or furnishings, or any recoveries relating to breach of warranty or guaranty, excluding, however, those amounts that are compensation for items that would otherwise be included in Gross Revenues hereunder, (xiii) receipts of a capital nature, including any financing of the Hotel, (xiv) revenue, income and proceeds of sales of tenants, licensees and concessionaires (distinct from rentals and fees paid by said parties to Owner) except where Owner holds an interest in any such tenant, licensee or concessionaire, and (xv) for purposes of calculating Net Operating Profits, without duplication of exclusions set forth above, revenue, income and proceeds of sales of tenants, licensees and concessionaires (distinct from rentals and fees paid by such parties to Owner) regardless of whether Owner has an interest in any such tenant, licensee or concessionaire, and sums credited or payable to any Condominium Unit Owner (other than Owner), in either case to the extent the same are not paid to the Owner or paid to the Operator on behalf of the Owner. 4.1 Operation of the Hotel. The Operator shall manage and operate the Hotel in a highly professional manner so as to maximize the value of the Owner’s investment, at a level, with respect to the Hotel, consistent with the Hotel Standards, and the reasonable requirements of any unaffiliated third-party lenders to the Owner (including as to Budget approval and reporting requirements), and shall provide or cause to be provided all amenities in connection therewith which are reasonable, customary and usual to such an operation, to the extent the Owner does not impair the Operator’s ability to maintain a hotel at a level consistent with the Hotel Standards by failing to provide sufficient funds in contravention of the terms hereof or failing to perform the obligations imposed on the Owner pursuant to this Agreement. (a) Select, appoint and supervise the general manager, financial controller and chief engineer; provided, that the Operator shall consult with the Owner with respect to, and deliver notice to the Owner upon, the selection and appointment of each of the foregoing; provided further , however , that except for the general manager (who shall be subject to the Owner’s approval), the Owner shall have no approval right with respect to any such appointment. The appointment and supervision of all other employees and personnel of the Hotel, who shall be employees of the Operator, shall be done by the Operator. Such authority or any part thereof may be delegated by the Operator to one or more persons employed by the Operator. The Owner shall have no right to supervise, discharge or direct any such employees or personnel and covenants and agrees not to attempt to so supervise, direct or discharge; provided , however , that the Owner shall have the right to cause the Operator to remove or terminate any Hotel employee in the event that the Owner can establish to the Operator’s reasonable satisfaction that such employee has committed an act or acts which (i) constitutes a crime and which may cause a material injury to the reputation, community standing of the Hotel, the Owner or a constituent member of the Owner (including, without limitation, a loss of any licenses or permits to serve alcohol on the premises), and (ii) such act constitutes a breach of a regulation or compliance requirement applicable to the Hotel, the Owner or any constituent member of Owner. In the event the Owner wishes to exercise its rights set forth in the preceding sentence, the Owner shall provide to the Operator a written notice (with accompanying documentation as appropriate) setting forth the basis for the Owner’s demand for the termination of such employee. The Operator shall perform appropriate background investigations on candidates for the positions of the Hotel’s general manager and financial controller as is customary and reasonable in the hotel industry in ____________, ____________, prior to the Operator hiring such personnel. To the extent that any employee of the Operator shall be devoting substantial time to a special project for the Hotel which is extraordinary, nonrecurring and non-routine, if such project has been approved by the Owner, to the extent required hereunder, or the cost of such project is covered by the Budget, then in lieu of including such expenses as an Allocable Chain Expense, the Operator shall have the right to treat such employee as an employee of the Hotel for the duration of such project, and allocate such employee’s salary and benefits, accordingly. (b) Determine and implement all labor policies (other than entering into a collective bargaining agreement with a labor union, which shall require the Owner’s approval), including with respect to wage and salary rates and terms, fringe benefits, pension, retirement, bonus and employee benefit plans and collective bargaining agreements; provided that the foregoing shall not in any way limit or reduce the rights and authority of the Operator pursuant to Section 4.2(a) ; and provided further that if such policies shall be materially different from those applicable to the Benchmark Hotel same shall be subject to the approval of the Owner, which approval shall not be unreasonably withheld. (c) Supervise and maintain accurate books and records as described in Section 9.2 hereof, including, without limitation, the books of account and accounting procedures of the Hotel. (d) Subject, for so long as same shall be in effect and to the extent required by the Holder thereof, to the applicable requirements of the Owner’s Loan Documents (and thereafter, to the extent that the holder thereof requires, to the reasonable requirements of any loan documents evidencing or securing a loan that replaces the Owner’s Loan), negotiate and enter into leases, subleases, licenses and concession agreements for stores, restaurants, bars, other Hotel Amenities, commercial and office space and services at the Hotel in the name of the Owner subject to the Owner’s consent, not to be unreasonably withheld; provided that Owner’s consent shall not be required if (i) any such agreement contains economic terms which are intended to result in the Owner receiving the fair market value rental or income for the applicable space consistent with then prevailing market conditions, (ii) such lease, license or agreement is subject to the Budget (does not cause the Budget, subject to permitted adjustments under this Agreement, to be exceeded), and (iii) such lease, license or agreement has a term of less than one year, or a term of greater than one year so long as such agreement is terminable on notice of 30 days or less. (e) Make or cause to be made all necessary repairs and replacements to the Hotel so that it shall be adequately maintained and furnished at a level consistent with the Hotel Standards. (f) Negotiate and enter into service contracts in the Owner’s or the Operator’s name (as disclosed agent for the Owner) required in the ordinary course of business in operating the Hotel to the extent provided in the Budget, including, without limitation, contracts for electricity, gas, telephone, detective agency protection, trash removal, extermination and other services which the Operator deems advisable, provided that any such contract having a term exceeding one (1) year and not terminable after the first year upon a maximum of 30 days’ notice, shall be subject to the Owner’s consent, not to be unreasonably withheld. (g) Select and obtain Consumable Supplies, Operating Equipment and FF&E for the operation of the Hotel in the normal course of business and subject to the Budget (or as otherwise permitted pursuant to the terms of this Agreement), and give the Owner the benefit of whatever discounts or other financial benefits may be received with respect to the same for bulk purchasing; the Operator shall use all reasonable efforts to obtain such discounts and benefits. (h) Determine all terms for admittance and charges to be made for guest and function rooms, commercial space privileges, and, subject to any applicable terms of the Existing Leases, entertainment and food and beverages policies. (i) Determine all credit policies with respect to the operation of the Hotel, including entering into customary agreements with credit card and barter organizations. (j) Establish entertainment and amusement policies (including pricing) with respect to the Hotel. (k) Subject to any applicable terms of the Existing Leases, establish food and beverage policies (including pricing) with respect to the Hotel, including the right to conduct catering operations outside the Hotel but for the account of the Hotel. (l) Hire such persons or organizations as the Operator may reasonably deem necessary to provide advice with respect to the Hotel’s performance or the Operator’s obligations hereunder, including, without limitation, attorneys (other than in connection with litigation where the Owner’s decision shall govern in connection with hiring an attorney), accountants (subject, if such accountant shall be other than a “big four” accounting firm, to the Owner’s approval which shall not be unreasonably withheld), and other professionals and specialists. (m) Establish and implement all advertising, public relations and promotional policies with respect to the Hotel including, without limitation, exercising the sole and exclusive control over all paid advertising, press releases and conferences, except that the Operator shall not mention the name of any of the principals in the Owner or their Affiliates without obtaining prior consent of the parties to be mentioned. (n) Subject, for so long as same shall be in effect and to the extent required by the Holder thereof, to the applicable requirements of the Existing Loan Documents, negotiate and enter into equipment leases, provided that, except where such leases are entered into in accordance with the Budget, same shall be subject to the Owner’s reasonable approval. (o) Subject to, for so long as same shall be in effect and to the extent required by the Holder thereof, the applicable requirements of the Owner’s Loan Documents, establish any other policy or perform any other act or function which in the reasonable discretion of the Operator is necessary to operate the Hotel on a day-to-day basis in accordance with the Hotel Standards. 4.3 Compliance with the Budget. The Operator shall use reasonable efforts to comply with and to cause employees of the Hotel to comply with the Budget. 4.4 Control of Gross Revenues. Subject to this Agreement, the Budget, and, for so long as same shall be in effect, the applicable requirements of the Owner’s Loan Documents, the Operator shall, as soon as practicable on behalf of the Owner, deposit all Gross Revenues (which for this purpose shall not be deemed to include the gross receipts of any Facility) and other monies involved in the operation of the Hotel, all of which will be the property of the Owner, into the Operating Account. All funds used in the operation of the Hotel, and all receipts and disbursements thereof (except insofar as petty cash is maintained in the Hotel) shall be deposited in and withdrawn from one or more Operating Accounts from time to time established in the name of the Owner. All risk of loss arising from insolvency of the depository institution with respect to funds in the Operating Account shall be borne solely by the Owner, and the available depository insurance proceeds, if any, shall be promptly turned over to the Owner to the extent required pursuant to this Agreement. 4.5 Discharge of Encumbrances. Subject to the Owner’s right to contest such items in good faith, the Owner shall provide sufficient cash to remove or provide by bond for the discharge of all encumbrances suffered to be placed on the Hotel or any part thereof contrary to any provision of this Agreement to the extent such encumbrances create civil or criminal liability to a governmental entity for the Operator, except to the extent that such encumbrances are caused by any gross negligence, fraud or willful misconduct or breach on the part of the Operator hereunder. This provision shall not extend to any mortgages encumbering the Hotel entered into in connection with the acquisition of the Premises and mortgages incurred in connection with the renovation and alteration of the Hotel, and all renewals, refinancings, extensions and modifications thereof. (a) The Operator may provide such guest rooms or other facilities, and any food or beverages, on a complimentary or discount basis to any employee of the Owner or the Operator or other guests as the Operator may reasonably determine to be advisable. However, any such complimentary or discount room, food and beverage shall be made available for the best interests of the Owner and with integrity. (b) The Operator, in its reasonable discretion, may provide food for Hotel employees, and allow the general manager of the Hotel and the general manager’s family suitable living quarters within or outside of the Hotel and the use of all the facilities of the Hotel. (c) The Operator shall permit the members, and the members in the members (including, in each case, the principals thereof), of the Owner and their immediate family members to stay at the Hotel from time to time on a complimentary or discount basis, provided that such privilege shall not be abused. However, any complimentary or discount rooms, food and beverage shall be made available for the best interests of the Owner and Operator and with integrity. (d) Any disagreement between the Owner and the Operator with respect to the provision of guest rooms or other facilities, food, beverages or other goods and services on a complimentary or discount basis will be resolved by arbitration in the manner provided in Section 9.6 . 4.7 Inspection of the Hotel. The Owner and its representatives may have reasonable access to and enter in and upon the Hotel at all reasonable times and upon reasonable notice to examine the condition thereof; provided , however , that such entry shall not interfere with the use, operation or management of the Hotel and shall be consistent with Applicable Laws and the rights of guests, tenants, lessees and concessionaires of the Hotel. 4.8 Standard of Liability. Notwithstanding any other provision of this Agreement to the contrary, the Operator shall not be liable to the Owner in any respect other than for the gross negligence, fraud or willful misconduct (including willful breach of a material provision of this Agreement) on the part of the Operator in connection with the performance of its obligations hereunder. 4.9 Meeting and Consultation with Owner. The Operator agrees to meet with the Owner from time to time upon the Owner’s reasonable request to review the operations of the Hotel and current matters of import; provided that the Owner shall not call such meetings more frequently than monthly, and in each instance, the Owner shall give the Operator adequate advance notice, in no event to be less than ten (10) days. 4.10 Agreements with Affiliates. The Operator shall not without the Owner’s consent (a) enter into any agreement or amend the terms of any agreement with an Affiliate of the Operator in the name and for the account of the Owner which is on terms materially less favorable to the Owner than if the same had been entered into with a person that is not an Affiliate following good faith, arm’s-length negotiations and with the exercise of reasonable business judgment, or (b) except pursuant to or as contemplated by this Agreement, pay or approve to be paid any fees or commissions to any Affiliate of the Operator.